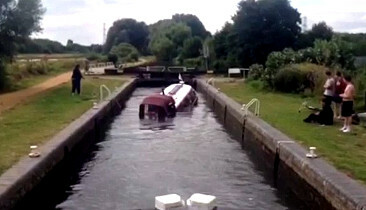 THE BBC is showing a repeat of its Close Calls on Camera programme which aired in May last year, featuring River Canal Rescue and the owner of a narrowboat that it rescued. The narrowboat sank in Fobney Lock on the Kennet & Avon Canal in August 2016, closing the canal for a week, and it was this long delay with a long queue of waiting boats that prompted Canal & River Trust to engage River Canal Rescue to undertake the removal of sunken boats more quickly. The sinking was filmed by a member of the public and subsequently came to the attention of the programme makers who contacted RCR to find out more. Managing director, Stephanie Horton, called this 'one of their most challenging rescues'. The programme will be broadcast on Wednesday 17th January at 11.45am on BBC1.